Insurers Are Refusing To Pay For Some Common Medications : Shots - Health News Health insurers are trying to spark a price war by refusing to pay for some brand-name medications unless they get a big discount. This forces some people to change their prescriptions. Tim Kilroy runs a business from his home in Arlington, Mass. 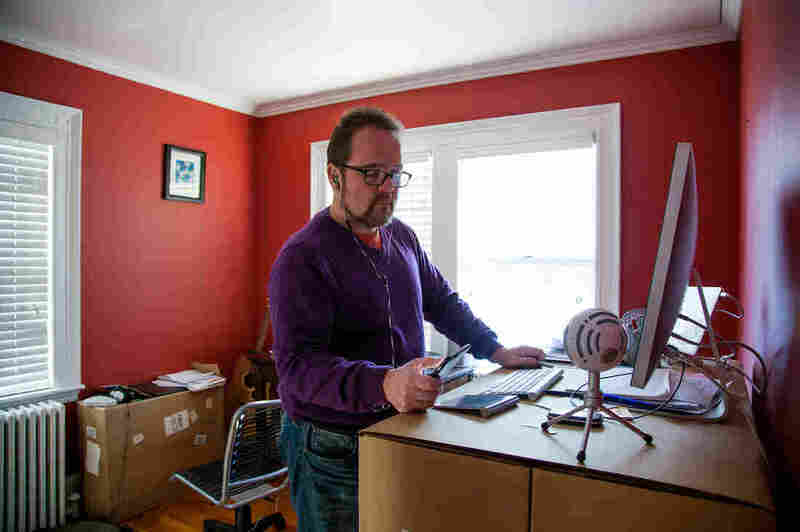 His insurance company quit covering the long-acting Ritalin that helps him manage his ADHD. Miller is the most vocal leader in what has become a war on drug prices. Express Scripts and its rivals including CVS/Caremark and OptumRX manage prescription drug coverage for insurers and employers. They're trying to spark price wars among drugmakers by refusing to pay for some brand-name medications unless they get a big discount. The result is that average costs for many drugs are falling. At the same time, consumers are being forced to change medications, sometimes to brands that don't work as well for them. Tim Kilroy is a father of five who runs a business out of his home in Arlington, Mass. Kilroy has attention deficit hyperactivity disorder — ADHD — and he is dependent on his medications to keep his mind, and therefore his business and family life, in order. "I had tried several drugs," he recalls. "I had tried Concerta; I had tried Adderal. Finding the right dosage can be really challenging." He spent six years trying medications, adjusting doses, switching and starting over before he and his doctor settled on a long-acting form of Ritalin. He'd finally landed on the drug that worked for him. But about a year ago he switched insurance and the new pharmacy benefit company — United Health Care's Optum subsidiary — refused to pay. "I thought, 'How dare you,' " Kilroy says. "How dare this company that I pay money to tell me how to manage my health care. I was really, really angry." He paid for the Ritalin once, but it cost more than $120 a month on top of his insurance premiums. So he asked his doctor to move him to another medication that was covered. Kilroy says it does a good job controlling his ADHD, but the side effects include a swollen prostate that makes it difficult to urinate. So now he's switching insurers again so he can get back on Ritalin. Kilroy is just one of millions of people affected by this battle between drug companies trying to make as much money as possible and insurers trying to drive down those prices. This year, more than half of all people with insurance will have some medications excluded from coverage, says Ronny Gal, a drug industry analyst at investment firm Alliance Bernstein in New York. "Drug companies have been pricing their drugs largely along the lines of, you know, whatever you can get away with and still have the patient get the drug," he says. "This year exclusion will become a standard feature of the industry, which is actually quite a shocker for a lot of patients." Express Scripts pioneered the strategy two years ago, when it announced it would no longer pay for 48 brand-name drugs. Right out of the gate it took on some big-name products, such as Advair — the blockbuster asthma drug made by GlaxoSmithKline, now known as GSK. Advair's price had risen more than 20 percent in 2013, according to data from SSR Health, a New Jersey-based investment research firm. Then on Jan. 1, 2014, Express Scripts tossed Advair off its drug list and moved its customers to rival asthma drug Symbicort. The results were immediate. Sales of Advair dropped $1.8 billion that year. The prices of both Advair and Symbicort fell 20 percent in 2014 and are still falling. GSK spokeswoman Jenni Ligday said in a statement that Advair was restored to Express Scripts' formulary last year. Express Scripts isn't alone. Caremark, Optum and Prime Therapeutics also refuse to pay for some name-brand medications. Dr. David Lassen, the chief medical officer at Prime, which is the pharmacy benefit manager for several Blue Cross and Blue Shield plans, says the company offers an exclusion option to its health plan customers. He says insurers are knocking drugs off their coverage lists because drug companies have undermined their other efforts to contain costs. In the past, insurers would charge a high copay for expensive drugs to steer customers to cheaper alternatives. "The pharmaceutical companies have developed member coupons, and many times those coupons wipe out the members' copay for them," Lassen says. "It really kind of circumvents the intended benefit design." The strategy of refusing to pay for some medications has forced drug companies to offer deep discounts on medications that have competition, according to analyst Richard Evans of SSR Health. While list prices for drugs have continued to rise, Evans wrote in a September report that after discounts drug prices rose only 0.7 percent in the second quarter of 2015 compared with a 4.4 percent increase in the same quarter a year earlier. For many customers, the changes are a small inconvenience. They have to call their doctors and ask for a prescription for a new brand of painkiller, acne medicine or asthma inhaler. The alternatives often work fine. But that's not always the case, as Kilroy's situation illustrates. Oncologist Barbara McAneny, immediate past chairman of the American Medical Association, says very few chemotherapy drugs are excluded from approved drug lists. But the medications used to help patients get through chemo, like painkillers and hormone treatments, are. This complicates her ability to care for her patients. "Some patients will tolerate one pain medicine, for example, but not another," she says. "One can cause nausea and the other pain medicine doesn't." If a medication is working, McAneny says it's totally inappropriate for anyone to change that medication and cause the patient to have symptoms.